Engineers in racing have one primary task: come up with the best possible package within the scope of the rules. And it looks like Suzuki’s clever engineers are doing just that, exploiting a loophole in MotoGP’s “no Variable Valve Timing” rule. Here’s what they’ve come up with for their new GSX-R1000. Since basically all variable valve timing systems are hydraulically or electronically actuated, MotoGP’s rule basically acts to keep VVT out of MotoGP racing. But Suzuki engineers have come up with a “dumb” VVT system what uses our good old friend mrω² (that’s the equation for centripetal force). If you google “how variable valve timing works,” you’ll probably come across our explainer. But if you’d rather us click your brain’s F5 key and give you a little refresher, we can do that, too. The purpose of Variable Valve Timing is to improve an engine’s volumetric efficiency, decrease NOx emissions, and decrease pumping losses. Basically: more power, better fuel economy, less pollution—it’s a great thing. Since the sprocketed camshaft and crankshaft are connected by a timing chain (which we’ve shown you in our Jeep teardown video, and which you can see in the image above), on non VVT-engines the valves will always open and close at the exact same time relative to the piston’s position. For example, if the intake valve closes at two degrees before top dead center, it will always close at two degrees before top dead center. Every time. But cam phasing changes all that by creating an adjustable angular relationship between the camshaft sprocket and the camshaft itself. The image above shows a typical cam phasing system. In it, the vane is rigidly connected to the camshaft, while the housing contains the timing chain sprocket. The crankshaft sprocket spins the housing’s sprocket, which turns the vane, which then rotates the cam. Electronic actuators pump hydraulic fluid into the voids between the vane and the housing, turning the cam clockwise or counterclockwise, thus retarding or advancing timing. 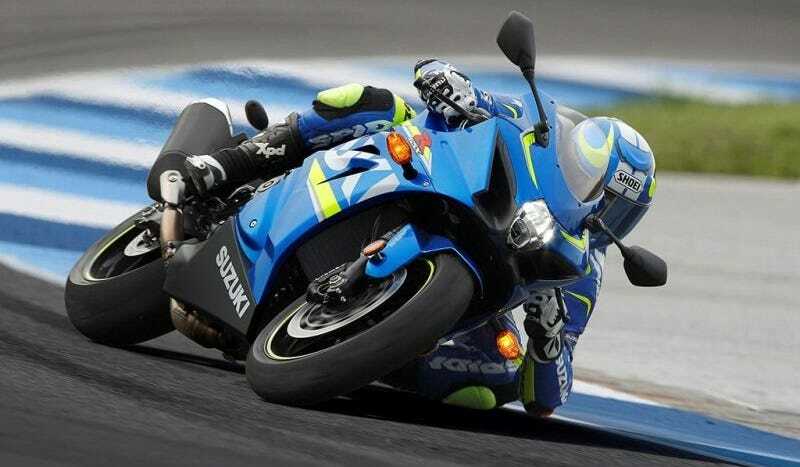 Suzuki’s system will be the first VVT system in any superbike when it launches in the GSX-R1000, and is based on the GSX-RR MotoGP racer’s design, according to Motorcycle News. The slick system manages to conduct cam phasing without hydraulic or electric actuators, instead using the centripetal force of metal balls. Sounds simple, doesn’t it? Well, it is. In a lot of ways, Suzuki’s system is similar to a traditional intake cam phasing system. The camshaft phaser is broken into two pieces, one of which is sprocketed and spun by the crankshaft via a timing chain (piece 1 above and below), the other of which is connected to the camshaft via splines (piece 2 above and below). The two halves of the phaser are connected via 12 metal balls, which sit in grooves on both pieces and are sandwiched between the two plates by a metal spring. As the engine speed increases and the crankshaft turns both pieces faster and faster, the balls will have a tendency to move outward along the grooves. Since the grooves in the two pieces are not exactly aligned, as the balls move radially, they change the angular relationship between the two halves of the phaser. Balls will be at the center of the phaser at low engine speeds, advancing valve timing, and balls will tend towards the outside of the phaser at high engine speeds, retarding timing. The grooves get shallower toward the outside of the two pieces, so as the balls move outward, they have to push against the metal spring that squeezes the two halves together. In this way, the spring governs how much the balls can move relative to engine RPM. A very stiff spring will only allow for retarded timing at very high RPMs, and a weak spring will retard timing even at low RPMs. Thus changing the spring K-factor (stiffness) is a way to tune the cam phasing system. It’s an interesting system, and one whose simplicity should hopefully yield better reliability and less weight than a conventional hydraulic system. You have to wonder why you don’t see such systems more often. Are there significant drawbacks to only being able to adjust cam timing based on RPM and not engine load? How advantageous is it to be able to change the relationship between RPM and phase angle on the fly, rather than being bound by physical relationships like Hooke’s law and centripetal force? How do you prevent the balls from wearing down and requiring replacement? There are still plenty of questions to be answered, but regardless, Suzuki bringing VVT to MotoGP in their GSX-R could start a trend and take the racing series to the next level.